Donald Trump delivered his first State of the Union address to Congress last night. Though he addressed Congress last year, it technically wasn’t a State of the Union. The speech was highly praised, just like last year’s was. Even his critics have had to either grudgingly admit it was well-done or come up with nonsensical excuses for why it wasn’t. What made it such a success? This was a pattern I noticed last year, so it’s not surprising to see it return. The idea behind a Yes-Set agreement is that you get your prospect to agree with you, progressing in each agreement you get, starting with small items and moving on to larger ones. By putting your audience in the mood of agreement, they’re more likely to keep agreeing with you. You can learn a lot more about how to do these in Unlimited Selling Power. By speaking in generalities that were impossible to disagree with and praising Mattis, a four-star general who served in the military for decades, the president made the Guantanamo quip (which would ordinarily be controversial) harder to disagree with because it followed earlier agreements. And in general, by opening the State of the Union with the economy, jobs, and citing figures on minority unemployment which can’t be disagreed with (at best you can say the statistics are wrong, or he’s not responsible for them, but not that those things aren’t good), the audience (the American people, not Congress) was softened up to agree with more controversial things, most notably, immigration. President Trump could have opened with some platitudes before going deep into controversial, hard-hitting issues, but he didn’t. Most people start too strong to get what they want, spoiling the mood. The president didn’t do that at last night’s State of the Union. By speaking of higher ideals and good things already done, the mood was set for doing what he wanted to do. Perhaps my memory is fuzzy, but President Trump used gallery guests in his State of the Union better than any other such speech than I can remember. It’s notable that having such guests at the State of the Union wasn’t the norm. Ronald Reagan, a “mater persuader” in his own right, was the first to do it. For every major issue in the speech, from the good to the bad, Donald Trump had a guest to personalize it. The most stirring was the North Korean defector, Ji Seong-Ho, as a symbol of defiance to the North Korean regime. Their presence quickly silenced the virtue signalers and open borders religionists. I shouldn’t need to explain why their being minorities made it doubly effective. The right hasn’t done as good of a job as the left in personalizing issues over the decades. It’s a major reason why “Conservatism, Inc.” has been so ineffective. Donald Trump’s State of the Union speech is an indication that this is changing. People forget statistics and figures. White papers don’t provoke an immediate response. Faces and people do. The structure of the State of the Union was set up to leave the best impressions. President Trump began and ended with high ideals, visual language, and a lot of the aforementioned Yes-Set agreements. By stuffing the most controversial parts of the speech in the middle, those things become harder to remember compared to the beginning and end, thanks to primacy and recency bias. Sure, the controversial things are the things that Trump most wants to do, but would a State of the Union speech make getting those things done likelier? By itself, no. Getting as big an audience to like you so that you can exert more influence to do the deals later, however, does. Liking is one of the six universal principles of influence, and if there is one of those that Trump lacks, it’s the likability factor. Does the State of the Union make non-fans (but not haters) more or less likely to like the president? The media’s own polls indicate the former. That’s why they’re melting down today. Footage showing Democrats in Congress not rising and cheering for low black unemployment, the national anthem, or veterans issues helps too. You can make yourself more liked by making your opponents more unlikable. That was one of Trump’s most potent weapons in the campaign against all his opponents. He baited them into doing much of his work for him in this midterm election year and chances are, you remember it because much of it took place at the beginning and end of the speech. 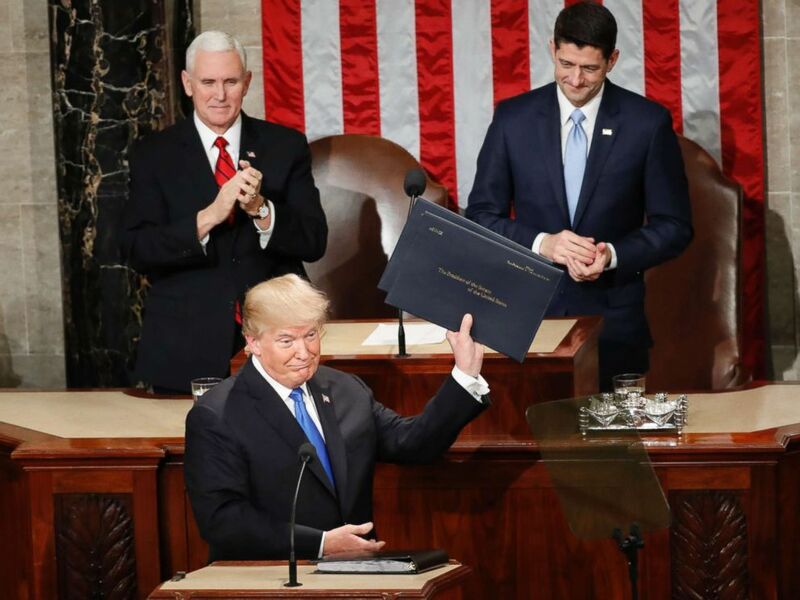 President Trump delivered with his speech last night, which is why his opponents are either going crazy or trying to leak another “muh Russia” report today, which is noticeably lacking in punch compared to the one on Sessions after last year’s speech. That’s how you know it worked. To make your own efforts work just as well as President Trump’s last night, read Stumped, the definitive guide on the Trump persuasion system. Did Mayweather vs. McGregor Live up to the Hype?